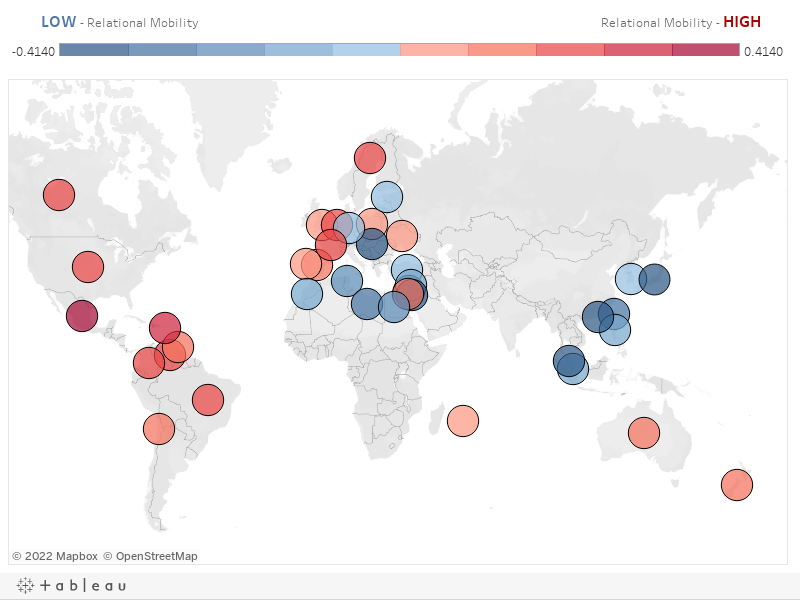 This is a ‘visualizer’ for the 2018 paper “Relational mobility predicts social behaviors in 39 countries and is tied to historical farming and threat” by Thomson, Yuki, and the 25-person team that made the world relationships survey possible. Poke, prod, and explore the data – it is freely available to download too. All relational mobility scores below were measured in the WRS, over multiple waves from late 2013 till mid-2016. The survey also included the interpersonal intimacy, self-disclosure, similarity, and social support measures. See the main paper (here) for details. What countries and regions are high and low in relational mobility? What do you notice? East and South-east Asia are low in relational mobility. So are many Arabic-speaking countries and regions. North America and Europe tend to be high in relational mobility. Big, dark red circles are high relational mobility. Small, dark blue circles are low in relational mobility. Take note of the Latin American countries – they are high in relational mobility. From a cross-cultural psychology standpoint, this is interesting because South America has always been considered ‘collectivistic’. But as far as relational mobility is concerned, South America is even higher than the uber-individualistic North America! Also take note of Hungary – Hungary is very low on relational mobility, but as you’ll see below, people in Hungary don’t act like people in other low relational mobility societies! Are perceptions of relational mobility accurate? Before moving on, let’s have a think about what the ‘relational mobility society scores’ are. Essentially, they’re the average perception of relational mobility from the people we surveyed in each country or region (using the relational mobility scale). But what if people’s perceptions are wrong? What if in low relational mobility societies, for example, there are actually plenty of opportunities to change relationships, and people simply think otherwise? To answer this question, we look at existing society-level variables that point to similar things as relational mobility: movement of relationships, values and mindsets that indicate closed or open interpersonal relationships, etc. Apart from that interesting region of Latin America, the results speak for themselves – people’s perceptions of relational mobility seem to be quite accurate! NOTE: Hover or tap the trend line for the p-value. How is relational mobility related to previously established cultural dimensions? Researchers have identified many ways in which people from different regions of the world differ. Shared values, mindsets, ways of understanding the self, and concepts about society are some ways in which we differ. We argue that in low relational mobility societies, people should have mindsets and shared values that reflect the relatively closed, long-term nature of interpersonal relationships in those societies: interdependence, collectivistic worldviews, and strong norm enforcement and hierarchies are some that come to mind. On the other hand, reflecting relative freedom to pursue one’s own relationships voluntarily, higher relational mobility should be associated with more individualistic, independent, and egalitarian values. Indeed, results seem to suggest that this is the case. What happens to humans’ behavior and mindsets when relational mobility is high or low? Researchers argue that as relational mobility increases, people become more attuned to 1) seeking out high quality, attractive relationships, and 2) trying hard to keep the relationships they like! Therefore, high relational mobility is associated with more active interpersonal behaviors and mindsets that support those behaviors. What makes some societies high and some low in relational mobility? Overall, it seems that societies with more pressure against survival and more “collaborative” ways of farming and agriculture tend to be lower in relational mobility. Here, we draw on two seminal theories on how distal social ecologies impact human society. First, Gelfand et al.’s (2011) widely influential work focused on ways historical and ecological threats impact the tightness of norms (see Cultural Tightness in the Cultural Variables section above). We explored many of the same ecological variables as Gelfand et al. (2011) to see how this affects relational mobility. Second, we drew on subsistence style theory–see Talhelm et al. (2014) and Uskul et al. (2008)–to see what impact this had on relational mobility. We found more threats and more stable subsistence styles seem to make some societies more close-knit, closed to outsiders, and require people to coordinate and cooperate more closely. Societies like this seem to afford less freedom and opportunity to meet and change relationships. The stand-out exception, once again, is Latin America. These societies display the behavior and mindsets we’d expect from high relational mobility societies. But, it seems they certainly didn’t get their relational mobility from their ecological and historical background. This is a fascinating avenue for further work! RelationalMobility.org was originally conceived as a companion website to Thomson et al. 's (2018) multi-country relational mobility paper published in PNAS. In particular, the site allows visitors to explore the associations presented in the PNAS paper visually using interactive scatterplots. The site now includes lists of papers related to relational mobility, as well as a behind the scenes look at how the authors collected data for the PNAS study, along with some basics regarding how to use the relational mobility scale. When using the relational mobility scale, please cite the following paper. Regarding relational mobility, contact the corresponding author of the Thomson et al. (2018) PNAS paper, Masaki Yuki, using the below methods. He will strive to respond in a timely manner. Regarding this website, and data visualizations, please contact Robert Thomson at Hokusei Gakuen University at rob.thomson@hokusei.ac.jp. RelationalMobility.org and the Thomson et al. (2018) PNAS relational mobility paper is the result of a massive collaborative effort by an awesome team of researchers from around the world. At the core of this effort is the Social Ecology & Psychology Lab at Hokkaido University in Sapporo City, Japan. Leading this lab is Dr. Masaki Yuki. We are always interested in the ways in which we can test, probe, and prod relational mobility as a construct and social reality. So if you'd like to work with us, or have an idea you'd like to run past us, please get in touch. Content on relationalmobility.org is licensed under a Creative Commons BY-NC-SA 4.0 license.